Compare discounts for Hotels Motels in Vancouver, British Columbia! Set on the Pacific Coast, in the shadow of snow capped mountains, Vancouver, is a cosmopolitan vibrant city which, to put it simply, is stunningly beautiful. With a compact downtown area located on a narrow peninsula bounded by Burrard Inlet to the north, English Bay to the west, Vancouver posses all the good qualities of a modern European city. It has streets that can be navigated by foot, excellent public transportation, and a developed arts, culture and sports scene. With two million people who have come to Vancouver from all over the world the city is truly multicultural and offers a huge selection of restaurants for all tastes. The immediate vicinity of Vancouver is an outdoor enthusiasts paradise. From the huge almost wild Stanley Park, located just off downtown, to the beaches, the mountains and the islands, the natural setting of Vancouver is just as impressive as its urban one. Ideal for both an urban and outdoor vacation, Vancouver is truly a world-class destination. Note: Lists are not identical. 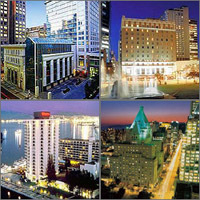 Different sites offer different accommodation options for Vancouver. Metropolitan Hotel is a boutique hotel located across the street from the Pacific Centre Mall and four blocks from the Vancouver convention center. The Pan Pacific Hotel Vancouver is a waterfront hotel built on a pier cruise ship terminal located, just a short walk from the core of downtown Vancouver. The Vancouver Sutton Place Hotel is a European-style hotel located near trendy Robson Street shops, two blocks from the business district. The Vancouver Opus Hotel is a new boutique hotel located in trendy Yaletown, just 2 blocks from the waterfront and close to numerous restaurants and bars. Wedgewood Hotel is an intimate boutique hotel located in Robson Square, half a block from Robson Street in downtown Vancouver. The Le Soleil Hotel and Suites is located in the heart of Vancouver's financial, shopping and entertainment district, surrounded by business landmarks such as Cathedral Place, Park Place, Bentall Centre, Waterfront Place and Vancouver Conference and Exhibition Centre. The Hyatt Regency Vancouver is located in the downtown core, adjacent to a SkyTrain station just 2 blocks from Robson Street shops. Hilton Vancouver Metrotown is attached to the Crystal Mall, with 150 stores catering to the Asian-Chinese community. Just across the street is Metrotown Centre, home to 500 shops and restaurants, 22 theaters, and three adult-youth game centers. The Vancouver Airport Marriott is located across the street from the Richmond Centre Shopping Mall, three miles from Vancouver International Airport. The Westin Grand, Vancouver opened in April 1999 as an all-suite, full-service luxury hotel located at the crossroads of the city's downtown, Yaletown, and Gastown districts. The Fairmont Hotel Vancouver opened in 1939 and restored in the 90s, is located in the financial district of Vancouver, one block from Robson Street shopping and four blocks from the cruise ship terminal. The Sheraton Vancouver Wall Centre is ideally located in the heart of the city's business, financial and shopping districts, with magnificent views of the mountains and the Pacific Ocean. Fairmont Vancouver Airport is a 14-story deluxe hotel connected to the Vancouver Airport international terminal. Situated in Vancouver's Coal Harbour, The Westin Bayshore Resort and Marina is the city's only downtown resort and conference centre. Panoramic views of the coastline, mountains, and Stanley Park add to the beauty and mystique of this unique resort. The Marriott Pinnacle Hotel is located one block from the seawall promenade and three blocks from the convention center and Robson Street shops.